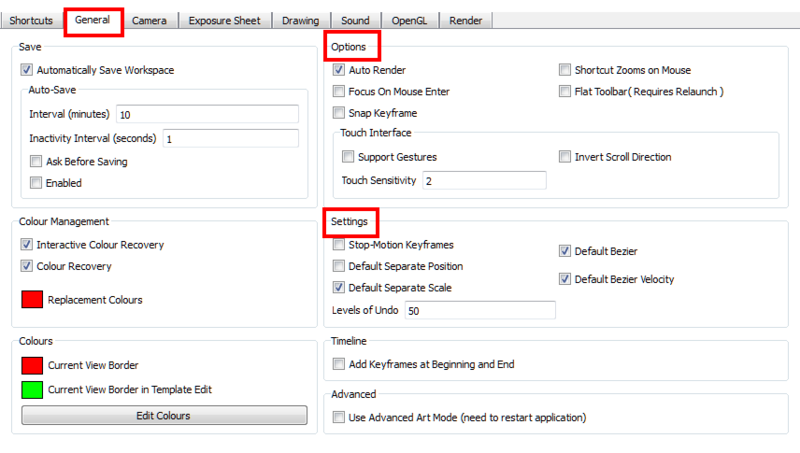 When setting up your scene in Animate, some preferences can help you work more efficiently. ‣ Mac OS X: Select Animate > Preferences. ‣ Press [Ctrl] + [U] Windows) or [⌘] + [U] (Mac OS X). • Show Locked Drawings As Outlines: In the Camera view, locked elements are displayed as outlines only. • Bounding Box Selection Style: In the Camera view, selected elements are not highlighted in colour but are displayed with the bounding box only. • Nudging Factor: The nudging increment value. • Use Rotation Lever with transformation tools: Enable this preference if you prefer to see the rotation lever when using the transformation tools. Without this preference enabled, hovering your cursor of the corner of an element’s bounding box is sufficient to rotate it. • Camera View Default Zoom: The default zoom value for the Camera view. • Thumbnail Size: The thumbnail size, in pixels, that appears in the Top and Side views. • Small Bitmap Resolution: The size, in pixels, of the smaller bitmap version of your image. When you import a bitmap image into a scene, a smaller version of it is created by the system in order to accelerate the compositing and playback processes. • Override Small Bitmap Files: Enable this option if you want the system to generate new versions of the already existing smaller bitmap files, every time you modify the Small Bitmap Resolution value. When the option is disabled, the already existing smaller bitmap versions will not be regenerated and will keep the same resolution as when they were created. • Enable in Camera: Dulls background bitmaps in Camera view. This allows you to see other elements clearly, such as the ones that have not yet been painted. • Enable in Camera Drawing Mode: Dulls background bitmaps in Camera view while using drawing tools. This allows you to see other elements clearly, such as the ones that have not yet been painted. • Wash Background Percentage: The Wash Percentage value. • Conservative Texture Management: Turns on and off conservative memory management for bitmap texture files. Performance will improve when this is enabled. If disabled, you will have a better on-screen rendering of bitmap files at the expense of slower performance. • Smooth Textures: Smooths out the pixels of bitmap images when zooming in; this improves bitmap image quality. • Alternate Gradient and Cutter: This is an alternative way to disable write in the OpenGL Backbuffer, required for some video cards (i.e. GeForce FX5200). Do not enable this option unless you are experiencing problems with gradients and cutters in OpenGL. • Use PBuffer for Picking: This will use an off-screen buffer for picking, resulting in a quicker response. This option should not be enabled if using a small capacity video card (32MB). • Support Triple Buffer: Enable this option for a better compatibility with Windows Vista if your video card driver does not allow to disable the triple buffering option. Not enabling this option may result in a dashing line when drawing a brush stroke. • Support Desktop Effects: Enable this option for better compatibility with Windows 7, Windows Vista and Mac OS X desktop effects. This will prevent graphic compositing problems from happening when the full-scene anti-aliasing option is enabled. • Texture Memory: The amount of temporary memory used to store bitmap texture files. • Vector Drawing Maximum Texture Size: This is the size that the .tvg file will be reduced to for better performance when in OpenGL render mode.